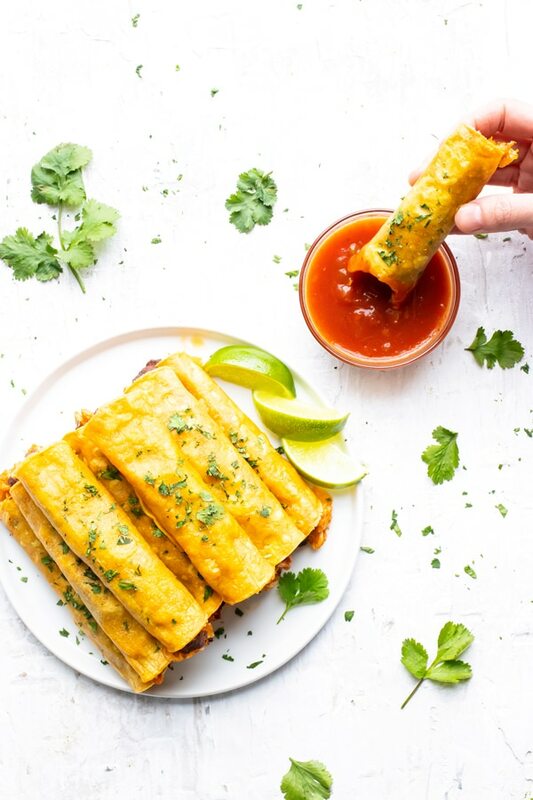 This Baked Chicken Taquitos recipe is an easy and healthy way to enjoy the frozen classic! 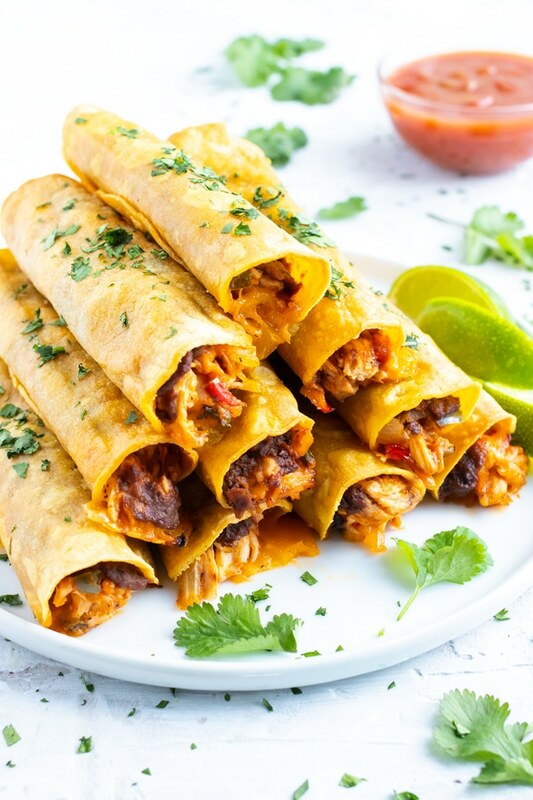 Pre-cooked shredded chicken gets mixed together with diced onion, chunky salsa, refried black beans, and cheddar cheese for a quick and delicious homemade taquito filling. Taquitos make a great finger food appetizer to serve at a party or even as a main dish for a Cinco de Mayo celebration. A few other Mexican food recipes you might enjoy include this Mexican Shrimp Ceviche, Chicken Enchiladas Verdes, and this Skillet Mexican Street Corn Salad. Chicken Taquitos Recipe for a Party! In need of an easy, make-ahead appetizer for your Cinco de Mayo party? These homemade baked chicken taquitos are THE answer to your hungry-people dilemma. Not only can taquitos be easily prepped ahead of time, but they are also just filling enough that they will tide your ravenous guests over until the main dish comes out. Don’t have a main dish? These baked chicken taquitos can also double as the star of the show and taste great with accompaniments like this Instant Pot Mexican Rice, Homemade Salsa, and a big bowl of The Best Guacamole. Below you will learn what are taquitos, ingredients needed, how to make chicken taquitos, how to roll taquitos, what to serve with them, and how to prep ahead for a party. Taquitos are a Mexican dish made from a corn tortilla that is then filled with chicken or beef, refried beans, and cheese. Traditionally, the taquito is then deep-fried until the tortilla gets crispy and the filling is warmed up. However, you can also bake taquitos in the oven (like in this recipe!) for a healthier alternative. While frozen taquitos can be easily found in your local grocery store, it does not take too much additional time to make your own healthier (and much tastier!) version at home. If you are in a rush, these Delimex frozen taquitos are our go-to when entertaining and are super easy to find. *Warning: Frozen taquitos often do contain gluten, soy, and other allergens. Chicken taquitos only require a few easy-to-find ingredients. 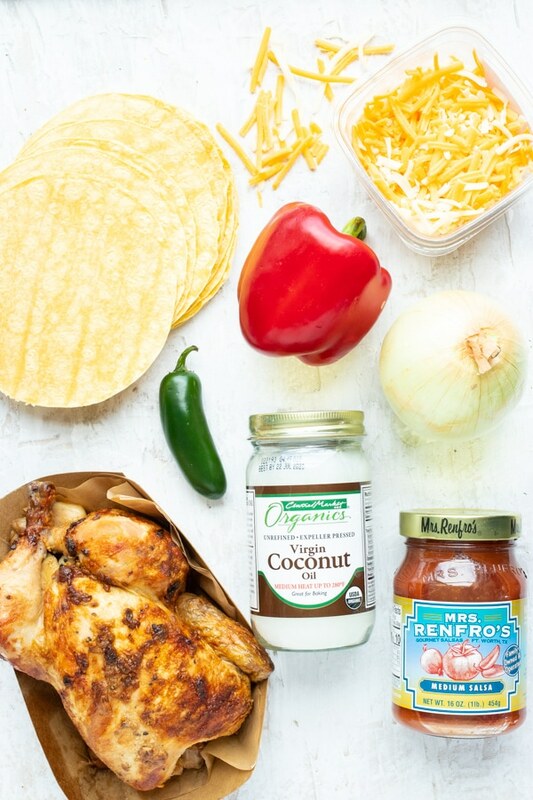 If you cook Mexican food on a somewhat regular basis, you probably already have most of these ingredients on hand. Cooked Chicken – A store-bought rotisserie chicken works best in this recipe and will save you TONS of time. Make sure you buy a traditional or plain-flavored chicken. 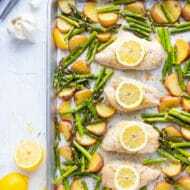 You can also use chicken breasts that you have cooked at home, too. Vegetables – Onion, bell pepper, and jalapeno might as well be the “holy trinity” of Mexican cuisine! These veggies combine with garlic to give the taquito filling superb flavor. Salsa – In addition to the vegetables, a large majority of the filling’s flavor comes from salsa. Medium salsa will give the taquitos a subtle kick whereas mild salsa will not. Also, opt for a thicker salsa versus a runny salsa for the best filling consistency. Refried Beans – Refried black beans are what I use in this taquitos recipe, but you can also use traditional refried beans. 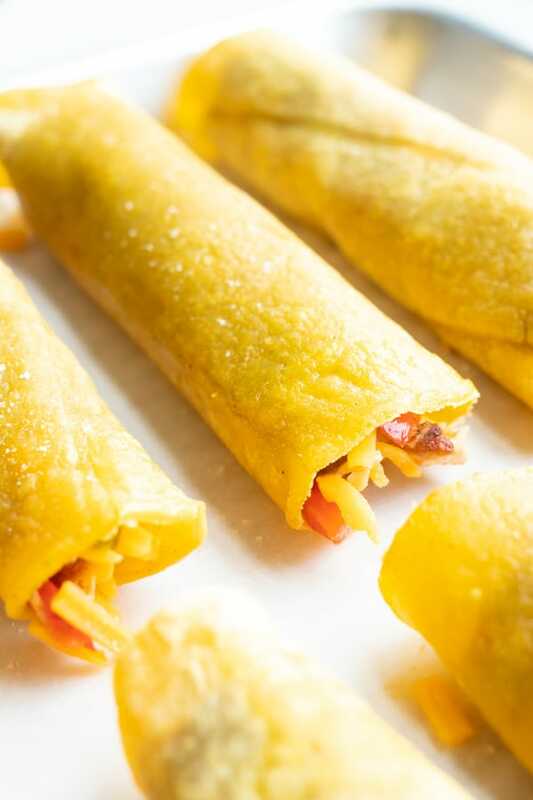 Cheese – Shredded cheddar cheese or Monterrey Jack cheese are my two favorite cheeses to use in a baked taquitos recipe. 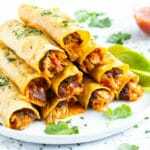 Mexican Spices – Just a few spices (cumin, paprika, and cayenne pepper) come together to give this baked taquitos recipe an authentic Mexican food flair. How to Make Chicken Taquitos? In a large saucepan over medium heat saute diced onion, bell pepper, jalapeno, and garlic for 3-4 minutes. 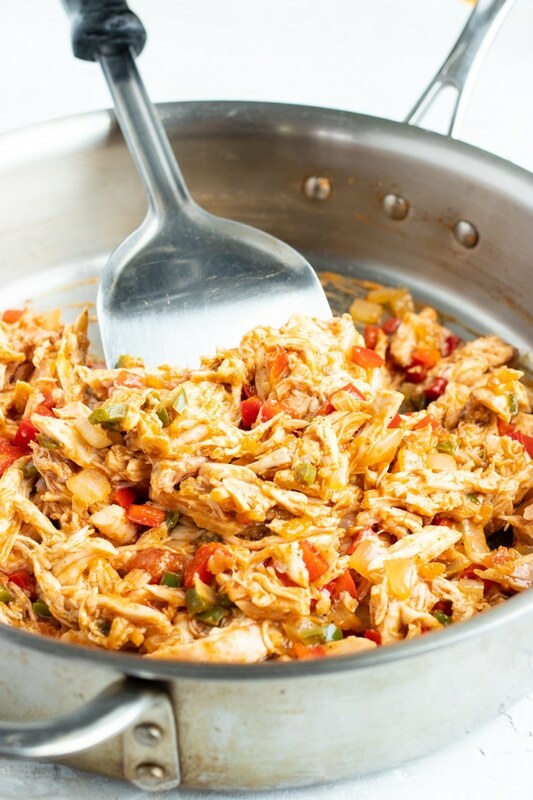 Add cooked, shredded chicken, chunky salsa, and spices to the skillet. Continue cooking for 3-4 minutes. Heat up corn tortillas in coconut oil until tortillas are softened and slightly brown on each side. Set aside on a paper towel-lined baking sheet to let drain. Bake taquitos in a 400 degree oven for 24-26 minutes, or until edges are crisp and slightly brown. 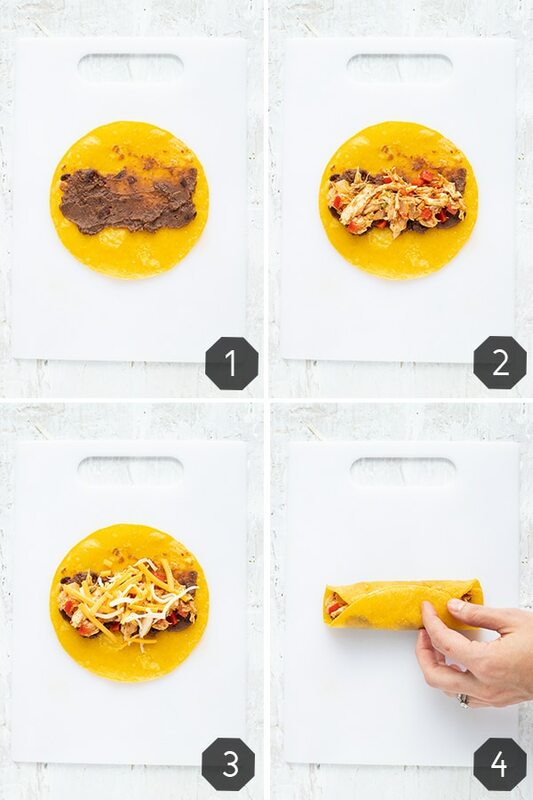 Rolling taquitos can be slightly challenging, but a few tips and tricks will help you become a taquito rolling master. Warming up the corn tortillas in a touch of coconut oil or avocado oil will soften the tortillas and make them easier to roll. Do not over-fill the taquitos with too much of the chicken filling. Too much filling will result in it spilling over the sides and making a mess! Place your filling just slightly off-center and towards the side you will start the rolling. Pull the taquito tightly as you are rolling. As soon as the taquito is rolled, place it seam side-down on a parchment paper-lined baking sheet and DO NOT TOUCH IT. Moving the already-filled taquito will make the filling come out and will weaken the tortilla. 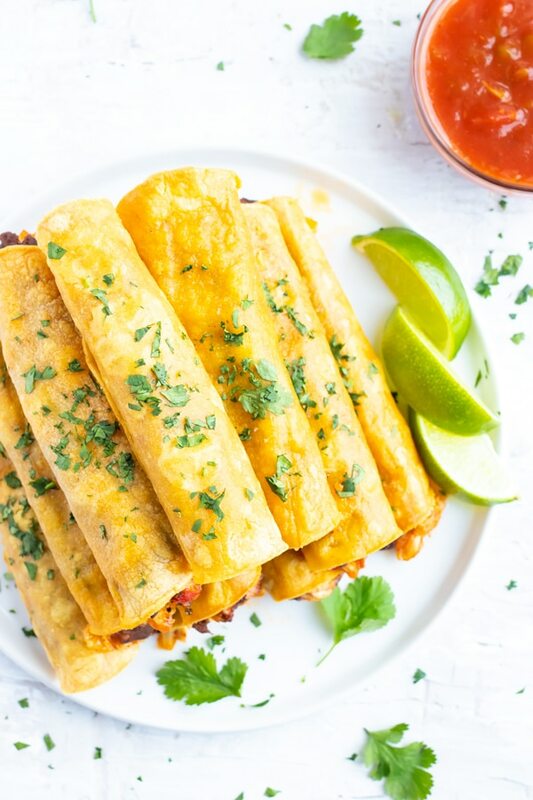 As I mentioned previously, these baked taquitos are so amazing because they can actually be prepared ahead of time and then reheated in the oven the day of the party. This taquitos recipe is best when prepared COMPLETELY and then reheated in the oven the day of serving. I would not recommend assembling the taquitos and waiting to bake them. They will most likely fall apart and not hold their shape. Storing: Once the taquitos are baked to crispy perfection, let them cool to room temperature and then transfer them to either a gallon-sized ziplock bag or a large tupperware container. Refrigerate for up to 2 days before serving. Reheating: When ready to reheat the baked taquitos, preheat oven to 325 degrees and bake taquitos for 10-15 minutes, or until heated through. Serve taquitos immediately and enjoy! 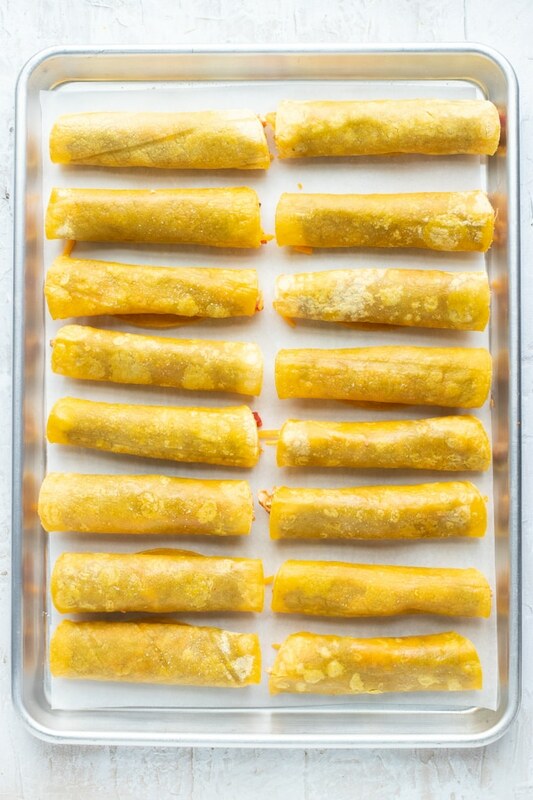 What to Serve with Baked Taquitos? 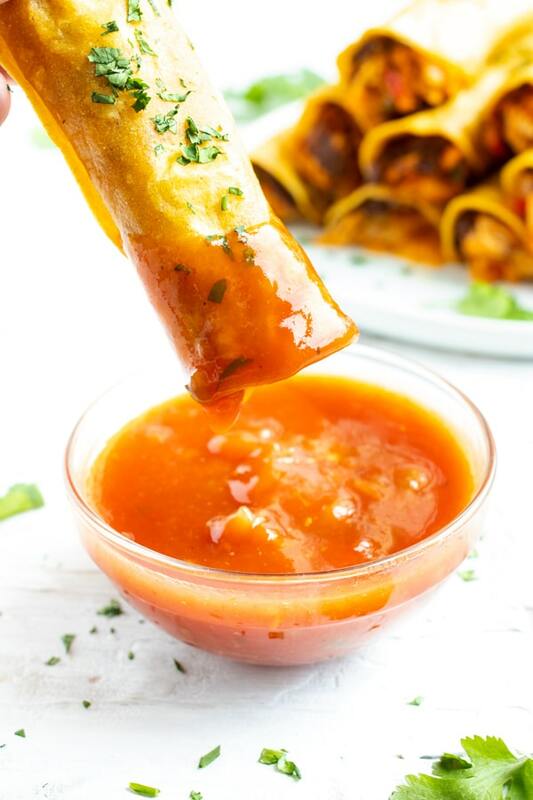 While these baked chicken taquitos are pretty fabulous and flavorful on their on, a few different Mexican-inspired dipping sauces would taste great with them, too.